Joichiro Nishi is a middle-school veteran of the Gantz world, having arrived there over a year before the beginning of the series. While running away from police officers after shoplifting, he fled onto an apartment building roof where he fell to his death. Much like how Kurono started out, he is also selfish and has a Social Darwinist approach to life. Nishi is reluctant to reveal anything about the Gantz or himself, but he runs a web site where he posts information about it (carefully avoiding Gantz's rule about informing outsiders, which would in turn prove fatal). Gantz calls him "Mr. Nishi," which is rather interesting given how informally or derisively he refers to most of the other participants. Nishi is killed at the beginning of the Tanaka/Suzuki Alien mission, but after six months of existing only inside Gantz's memory banks, he is revived by Kaze at Kurono's request following the end of the Oni mission. 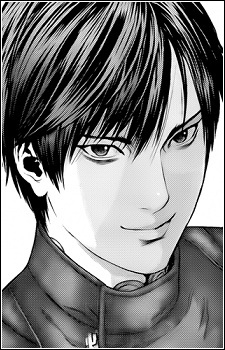 Ostensibly, Kurono hopes that Nishi will be able to provide information about Gantz to the game players. After being ostracized and bullied by his classmates, which ended with them hurling him out of the classroom window, he has killed all of them (except one girl who had a crush on him and did not support the rest in wanting to chase him out of the school). After this, civil armed forces are sent to kill Nishi. Nishi manages to kill many of the men sent to kill him, but after an intense battle with the armed forces he is severely wounded and was only able to avoid death because Gantz called the Hunters for a new mission.